Do the Data Really Say Female-Named Hurricanes Are More Deadly? A recent study has indicated that female-named hurricanes kill more people than male hurricanes. Of course, the title of that article (and other articles like it) is a bit misleading. The study found a significant interaction between the damage caused by the storm and the perceived masculinity or femininity of the hurricane names. So don’t be confused by stories that suggest all female-named hurricanes are deadlier than male-named hurricanes. The study actually found no effect of masculinity/femininity for less severe storms. It was the more severe storms where the gender of the name had a significant relationship with the number of deaths. The study looked at every hurricane since 1950, with the exception of Katrina and Audrey (those two are outliers that would skew the results). Many critics of the study believe that it is biased, since almost all of the 38 hurricanes before 1979 had female names (there were two male names in the early 50s). It’s possible that our ability to forecast hurricanes has vastly improved since the 50s and 60s. So, these critics say, the difference is simply because more people died in hurricanes back when they all had a female name. Let’s perform a data analysis to see if that is true. We will use pre- and post-1979 to distinguish between the predominantly female-name hurricane era and the era of mixed hurricane names. I’ll use the exact same data set that was used in the study, which you can get here. For the 92 hurricanes in the study, the number of deaths and the normalized damage was recorded. The study showed that these two variables are highly correlated, so it’s important to consider both factors. If we find there were more deaths in hurricanes before 1979, we need to make sure the reason isn’t simply because those hurricanes caused more damage (implying they were bigger storms). We can start by using a scatterplot to plot the two variables against each other, using whether the hurricane came before or after 1979 as a grouping variable. Hurricanes that occurred during 1979 were put in the After group. We see that the two deadliest hurricanes (Camille and Diane) both occurred before 1979. If you look below them, you’ll see that many hurricanes in both eras have caused the same amount of damage, yet resulted in far fewer deaths. Meanwhile, the two most damaging hurricanes (Sandy and Andrew) both occurred after 1979. These hurricanes caused more than three times the damage of Camille and Diane, yet resulted in fewer deaths. This gives some credibility to the idea that our improvement in being able to predict hurricanes has resulted in fewer deaths. However, Hurricane Donna supports the opposite idea: five post-1979 hurricanes resulted in more deaths than Donna, despite causing significantly less damage. It’s hard to draw conclusions from the scatterplot. Of course, the hurricanes labeled in the plot above are pretty rare. Most of the 92 hurricanes had normalized damage less than $30 billion and fewer than 100 deaths. The descriptive statistics below show just how much of an impact those big storms can have on an analysis. If we look at the mean, everything becomes clear! On average, hurricanes before 1979 had 11 more deaths despite causing half a billion fewer dollars in damages. But when we look at the median, which isn’t sensitive to extreme data values, the values are almost the same. Part of the problem is that so many smaller storms are included. The study already concluded that the name doesn’t matter for smaller storms. So let’s just focus on the big storms. The median normalized damage for all 92 storms is $1.65 billion. I took only the storms that have caused at least that much damage (there were 47 of them) and looked at the descriptive statistics again. Once again, the mean and median paint different pictures. The mean shows that a much higher number of deaths occurred in big storms before 1979, even though those storms caused the same amount of damage. 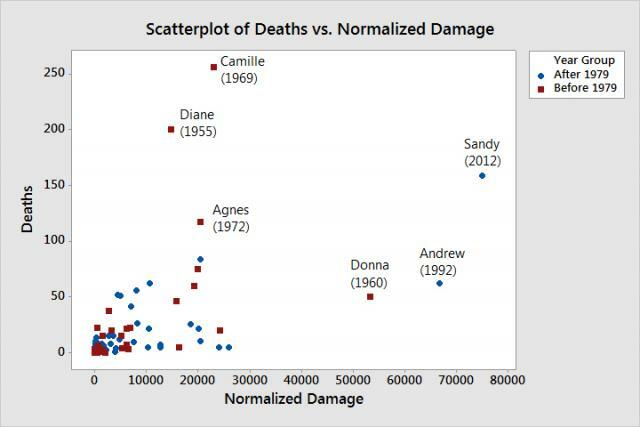 However, this is because hurricanes Camille, Diane, and Agnes are heavily influencing the mean for deaths before 1979, pulling it up much higher than the After-1979 group. And hurricanes Sandy and Andrew influence the mean for normalized damage after 1979, pulling it up to equal the damage before 1979. With data this skewed, the medians are a more accurate representation of the middle of the data. The median for deaths shows that there were slightly more deaths in big storms prior to 1979. However, those storms also caused more damage, implying that could be the reason for the larger number of deaths. And even if we ignore the fact that the hurricanes before 1979 caused more damage, a Mann-Whitney test (which compares 2 medians, as opposed to a 2-sample t test which compares 2 means) shows that the difference in deaths is not statistically significant. The p-value is 0.1393, which is greater than 0.05. There isn’t enough evidence to conclude that hurricanes caused more deaths before 1979. 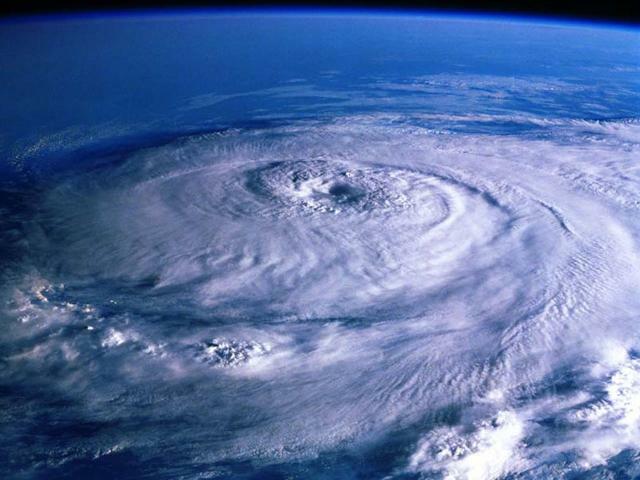 Can We Really Conclude that Female-Named Hurricanes Cause More Deaths? The lack of conclusive evidence from our data analysis certainly makes the idea that hurricanes with female names cause deaths plausible. But there are other issues to consider. For example, the gender of the hurricane name was not treated as a binary variable, which would group each hurricane as either male or female. Instead, nine independent coders rated the masculinity vs. femininity of historical hurricane names on two items (1 = very masculine, 11 = very feminine, and 1 = very man-like, 11 = very woman-like), which were averaged to compute a masculinity-femininity index (MFI). Do these 9 coders represent how most Americans would rate the femininity of names? Would you rate Barbara as more feminine than Carol or Betsy? The coders did, giving Barbara a 9.8 while Carol and Betsy were 8.1 and 8.3 respectively. And the MFI is important, since it was found to be the gender variable that had a significant interaction with normalized damage. When gender name was treated as a binary variable, there was no interaction. But masculinity-femininity index aside, the study did have some very interesting findings. I’m sure additional research will be done in the years to come to see if the findings hold true. Let's hope that then we’ll be able to know for sure whether people underestimate female-named hurricanes or not. Until then, if a hurricane is bearing down on your neighborhood, I would make sure to board up the windows and buy out the supermarket's bread and milk, regardless of the storm's name.